The Fall of Astapor #56. Dornish Fiefdom is probably the best faction-specific limited econ location released thus far; and might just be the best limited econ location in the game. A loyal, non-unique location that can potentially generate an extra 1 - 2 gold per turn for a House that has traditionally struggled to match it economically with the likes of Lannister and Tyrell. 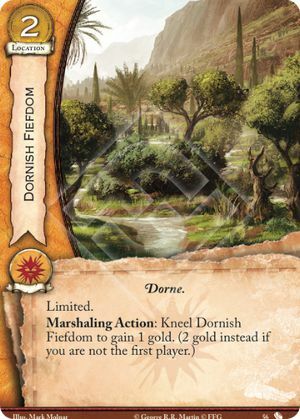 Being loyal, Dornish Fiefdom can marshal for 1 gold in a Fealty deck; regardless, Dornish Fiefdom effectively pays for itself the turn it is played provided you are able to meet its threshold condition i.e. not being the first player - making it ubiquitous in melee games. And going second is not hard to achieve for Martell, as most decks are trying to leverage the 'go second' theme. Dornish Fiefdom allows for less reliance on econ plots which means that deckbuilding options have opened up incentivising high initiative, effect driven plots to see play - such as Naval Superiority and Battle of Oxcross. What to do with all his gold? Unfortunately, House Martell has yet to receive 'The-Bomb-That-Was-Promised' i.e. The Red Viper (OR) and the current meta has seen the resurgence of low-cost 'weenie' decks; as such, this extra gold is not being spent on high cost characters and is instead paying for costly events - Vengeance for Elia is seeing more play (not that it really went away) and other events, such as The Prince's Plan are getting a look in. In summary - when building your Martell deck, auto-include three copies of Dornish Fiefdom.